A friend made mention to me about how I color Scout Crossing, I never had to really answer that before, but if I had to paint a picture for everyone, imagine a Chinchilla with a paint brush, on 10 cups of coffee (and maybe mild vomiting). What exactly were they legends for? they weren’t legendary for anything like THIS, were they? Not as robustly forward as that, but not as terrifying as this. I DIDN’T TELL YOU STILLS WAS GHEY. 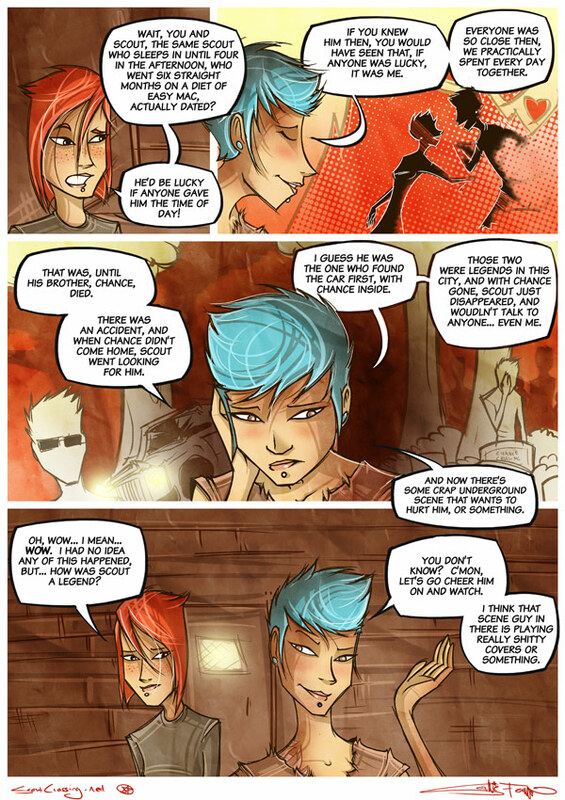 I’ve read some good webcomics, but this is easily becoming my favourite. haha, I have gingers everywhere, but the truth is, that red is almost the perfect color for my comics, brown hair is so…eh. I much prefer infroamtive articles like this to that high brow literature. wow!! i haven’t been able to read your comics since the middle of may, and i’ve rather enjoyed catching up; especially with Scout Crossing. it’s gone from interesting to incredible, i’m really looking forward to seeing where this goes. great work!! you changed something about the comic. maybe it was coloring? i don’t know, but whatever it is, i think it’s EPIC! there’s so much more depth here now and the emotion just comes across with a roundhouse kick instead of a punch! DAMN! W‘hen do we find out what they were legends for?? I’m in love with Penny. Somehow, I don’t trust Penny… Am I the only one who gets the feeling she may be up to something? Oh your comic is getting reaaaally good. Can’t wait to see what happens next!